But guess what folks, it’s clear. Boom, boom, boom, hear them ring . . .
Our ears that is . . . Hear them ring all day. Just another sound of spring. By way of background, folks, last September, when George Ferguson was mayor, Abbotsford council voted to “ban the cannons” and make Abbotsford a livable city. 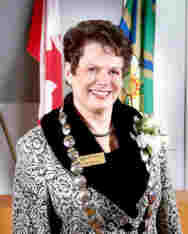 Since Mayor Mary Reeves came on board, she has waffled under the thumb of the province, failing to stick up for the city, and insisting the cannons continue their song.